Dan Raile of Pando.com attended a cyber security conference last week in San Francisco and obtained a CryptoKids Fun Book, basically a coloring and puzzle book featuring characters that appear on the kid-themed website. "Is it strange that the NSA, which takes such care to stay out of the public eye, should be so keen to capture the attention and aspirations of the young?" asked Raile. The book has a link to the NSA's kids website. The anthropomorphic "CryptoKids" each come with bios and backstories. Characters include Decipher Dog, a signals intelligence analyst; T. Top, a teenaged turtle who specializes in computer science; and Rosie, a fox who also functions as a language analyst. The website features activities and games that interested kids can play online. They can also download print outs to make ciphers or coloring pages. Some of the games and activities may be fun for younger kids who like to color or play online games, but most of the activities have an expiration date. That is, older kids, those in late middle school and high school, are going to spend their time playing on things that are, you know, actually fun and entertaining, not filling out NSA activity books. Still, this is an effort to put a fun face on what the NSA does, and perhaps raise awareness for its struggling recruitment efforts. The message: spying is totally "kewl." Or something. Unfortunately, there are not any coloring printouts or activities with CryptoKids teaching kids how to lie before Congress like Director of National Intelligence James Clapper, who oversees the NSA. In March 2013, Clapper was asked directly by Sen. Ron Wyden (D-Ore.) whether the intelligence agency collected any "type of data at all on millions or hundreds of millions of Americans" during a Senate Intelligence Committee hearing. "No, sir," Clapper replied. "Not wittingly. There are cases where they could inadvertently, perhaps, collect, but not wittingly." Just a few months later, in June 2013, it was revealed to the American public that the NSA has been conducting mass domestic surveillance on Americans by collecting the metadata of virtually every phone call made in the United States. Though some who unequivocally support the NSA and its tactics, the White House Review Group on Intelligence and Communications Technology and the Privacy and Civil Liberties Oversight Board, both government panels, determined that the program has not prevented any attacks. 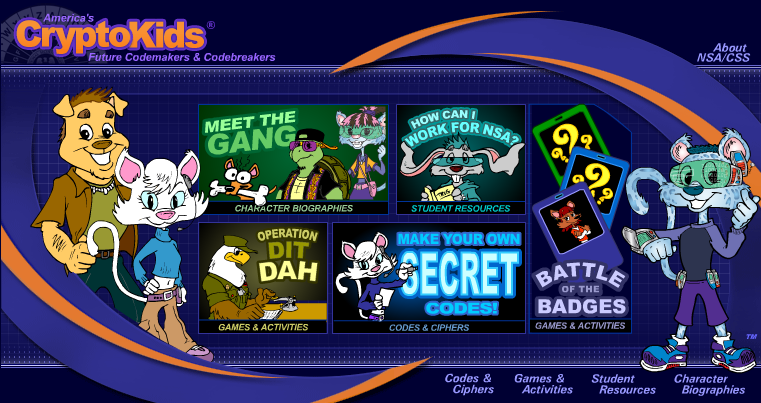 Unsurprisingly, there's nothing on the NSA's kid-themed website that teaches young about the civil liberties guaranteed by the Constitution, such as the Fourth Amendment, which protects Americans from illegal searches and seizures conducted by shadowy government intelligence agencies. It's funny enough! I've never dreamed of a career as a spy, but I remember the crowds of girls who dreamed about it after watching "Totally spies" or something. I'm absolutely sure it's not ok to report on the actions of friends, but I'm sure somebody will come to do this. I don't care much, because I'm not afraid, but if I need a job, I'd rather work with https://top5resumewriting.services/ for my resume than try to find such a weird work. I'm not the best person, but this work isn't Mi-6 as well.